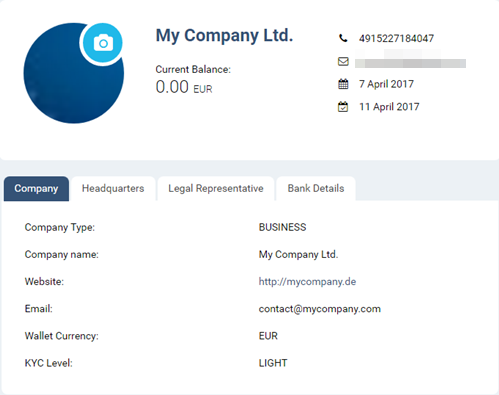 In the web menu, choose My Account in order to see information related to your Moneymailme account: current wallet balance, registration date, date of last login, mobile phone number and email associated to the business account, company data, legal representative data and bank details (as setup in Bank Account section). Information displayed here is not editable, except for the profile picture. Click on the camera-like icon to upload a profile picture. Suggestion: put your company logo. Note: This is not the logo of your e-shop. You can set a different logo for each one of your e-shops. See Shops section for details. Note: KYC Level refers to the level of data you have provided for your business account. KYC Level as LIGHT means you have created a business account, but you have not provided documents yet to support your identity. Once you have proved your identity with documents, your KYC Level becomes REGULAR. Go to Documents section for more details. Note: You cannot activate an e-shop if your KYC Level is not REGULAR. Go to Shops section for more details.